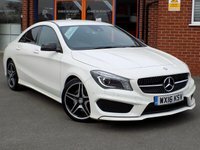 Finished in a crisp Cirrus White this luxury CLA combines style with comfort, quality and great economy costing you just £20 a year in road tax. Comes well equipped and has Full Service History (3 services) Its excellent specification includes a DAB Radio Upgrade as well as Garmin Map Pilot Navigation, Bluetooth, Cruise Control with Speed Limiter, Front and Rear Parking Sensors, Rear Privacy Glass, AMG Styling and 18" AMG Alloys. Please ask for details of our fantastic finance and warranty packages, subject to status, T's and C's apply.